An article by Phinneas Gage dealing with collective bargaining agreements between a small shop and the Canadian postal workers union. I was in for one hell of a shock today. I finally got the names and addresses of the four ‘Rand’1 members working at the courier company. In the same day I saw them threaten to wildcat and then get fired. I had the pleasure of introducing them to the glories of union representation only ten minutes before Sylvain, the boss, accused the workers of blackmailing him and then fired them. By talking to the workers I pieced together what had happened. The boss used to run a thirty-person outfit that was unionized under the Canadian Union of Postal Workers (CUPW). When they lost their major contract the company shrank down to one driver. Now they are building their business back up; as they hire new drivers they do not tell them about the union. There are now eleven people working in the shop, well eleven minus four fired men. These guys will likely be replaced by a new batch on Monday. The boss was bullshitting the union too, he never told us when he hired more guys on. Even though the contract said that they had to inform us of any new workers, they also had to send them over to the union office to sign cards as a condition of work. The employer also had to provide us with regular seniority lists. In every instance they simply ignored the contract. They even hired these four guys on as independent contractors under a separate deal than the collective agreement we negotiated with the company. They pretended the union didn’t exist and the strategy worked for them for three years. While the workers were getting their letters one of the fired workers looked across the room at me as he took his dismissal letter out of the boss’ hand. He smirked at me and winked. That’s when it hit me- these guys didn’t care. They agreed to certain terms and conditions and the employer broke their side of the deal. They didn’t have a union as far as they knew so they created one on the spot. They drafted up a letter with a list of demands, all four signed the bottom and handed it in. If Sylvain didn’t meet their demands they said they would try and convince the courier company’s clients to stop using them as a courier and would show up for work Monday but refuse to do anything until their demands were met. These workers didn’t know about the union, then we show up saying we ‘represent’ them. I looked across the room at Al the local president who was negotiating with the boss. He was a model of restraint; Sylvain on the phone was not. I could hear words not fit for print from 15 feet away. For a brief moment I saw how comical this all was, I saw things from the point of view of the four guys who just got fired. The workers invited us along for the ride; they didn’t need us to represent them, they wanted outside witnesses to support a struggle that they took on themselves. We were frowning; to us this was serious business. They were smiling; to them it was a joke. We all had a conversation in the parking lot afterwards. I told them that we would grieve the firings, and our reps would also bring up their return to work at negotiations for the new contract. Their odds of getting their jobs back were pretty good, and the odds of them getting back pay were even better. They said a settlement would be nice and they would think about their jobs, but what they really wanted was to cause as much trouble for that business as humanly possible. I said I would see what I could do, returning the smirk. Later that day while driving back to the union office Al was horrified to hear me call the situation funny. He didn’t like my take on things at all; he said I enjoyed the conflict too much. Al and I have been through a lot and I respect him, he’s got thirty years at the Post Office under his belt and hasn’t been afraid encourage workers to take action. I told him I would think about what he had to say. The Canadian Union of Postal Workers’ unionism is one of worker organizers servicing a contract that is negotiated with the employer. A large body of volunteers and a handful of paid staff provide a service to workers who are expected to come to the union with their grievances. Servicing a contract is pointless if the union doesn’t know who is in the shop, how many workers are in the shop and what the issues are. A contract is even more useless if the workers don’t know it exists. In this shop the collective agreement required the employer to come to us when they hired new people. They pulled a fast one on us, as the grievances roll in it is becoming apparent they have pulled a fast one on us for three years. The point of a contract is to mark gains negotiated by the bargaining committee. In exchange we trade off our right to strike and submit to a grievance procedure where issues are settled off the floor allowing the business to run smoothly. Most of the Canadian Union of Postal Workers is based in the post office and we have a large volunteer steward body that can help people with filing their own grievances in our postal sector bargaining units. A situation like this can’t happen at the post office because the union is institutionally a part of the culture of the workplace. Small shops face a real challenge to this model because there isn’t a concentration of shop stewards to enforce the contract. When these workers took action they acted as most workers in most industries do when confronted with an injustice at work, they withheld their labour. Trade unionists tend to see non-union industries as static and without struggle but in a lot of cases the struggle is far more direct and personal in nature when the union is not there. In fact the union, through the contract is what puts limits on this struggle and determines its course. Al seemed to think that if we had better contact with the shop we could have filed a grievance and these guys would still have their jobs. Al’s probably right. But the problem was that a contract cannot enforce itself, a contract does not make a union. 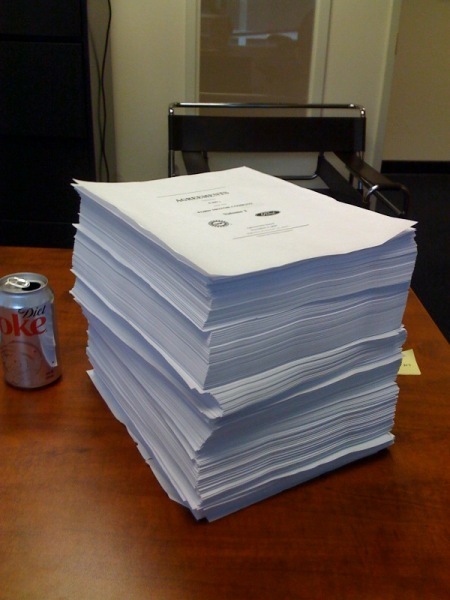 Contracts are pieces of paper; unions are relationships between workers and their work. The reason we didn’t have better contact with the shop is all the workers who voted for the union were gone and replaced with new workers who weren’t told about the union. These workers did not have the chance to struggle together as a group to get the organization needed to enforce the contract. When they did struggle they did the one thing the contract says you can’t do, they struck and then got fired. Next week they will be working at another courier firm and a new batch of drivers will be working at this company. When these new drivers are hired they will be union members as soon as they walk in the door, the company will inform us of their membership and their contract and everyone will follow the rules. Not because they want to but because the company wants to avoid this from happening again too. The biggest irony of the whole situation is that it was these workers who did not know about the contract and went out and acted against the contract were fired for violating the contract. That gave the contract life again. It was no longer a piece of paper but a document that outlined a relationship between a group of workers and their boss. It also ensures that as long as the contract is followed what gave the contract any real meaning on the job won’t happen again. "A Strike By Any Other Name"